On the 15th and 16th November 2017, the Institute for Conflict Management offers students and employees of the European University Viadrina in Frankfurt (Oder) a two-days lecture & workshop series on conflict management methods and various fields and forms of their application. The workshops combine input sessions with skill oriented exercises and smaller simulations. Participants will be invited to explore the potentials as well as the challenges and dilemmas of mediation, also in the peace sector. Tatiana Kyselova, from Kyiv-Mohyla Academy, will hold a lecture on “Facilitating Dialogue in Crisis Regions” on 15th November 2017 (5.00-6.00 pm, HG 109 (Senatssaal)). 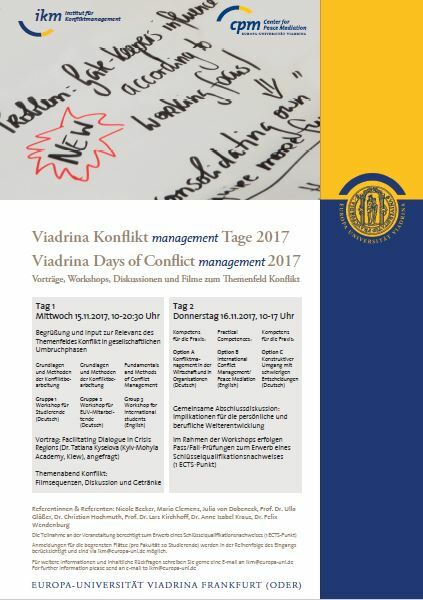 Please find the schedule of the Viadrina Days of Conflict (management) here. Active participation and a successful completion of a pass/fail test qualifies students of the European University Viadrina to obtain 1 ECTS for the key qualification certificate. You are invited to apply by sending this application form to ikm@europa-uni.de. As the number of participants is limited (20 students per faculty), applications will be considered according to the submission date. For more information or content related questions, you are welcome to send a mail to ikm@europa-uni.de.